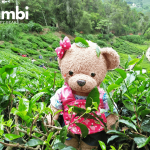 Located in Gohtong Jaya, the Genting Highlands Strawberry Leisure Farm is a very popular tourist attraction for children and family alike. My mama and papa brought me to this leisure farm to pick my own strawberries. 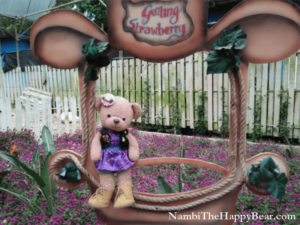 Looking for directions to the strawberry farm in Genting? Assuming you are driving from the Karak Highway towards Genting Highlands, look out for the Gohtong Jaya roundabout. After you saw the Hotel Seri Malaysia Genting on your left, take the first exit at the roundabout and follow the road till its end. The farm is located opposite the Mawar and Bunga Raya Apartments. 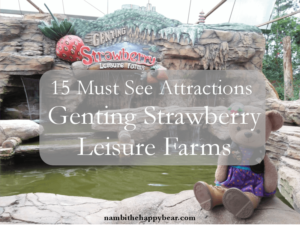 You could also look out for free parking spaces at the Gohtong Sport Centre before walking across the road to this strawberry farm in Genting. Gohtong Jaya was quite easy to navigate as it was a small town. Once we arrived at the entrance, the first thing that caught our eyes was this enormous Strawberry Chocolate Fondue. My papa said that it was not a chocolate fondue but merely a water fountain. I think my papa was lying to me. This was a Strawberry Chocolate Fondue alright! Woah, I still remembered the sweet chocolate smell in the air. I wanted to taste the chocolate using my paws but my mama didn’t allow me to. While papa was getting our entrance tickets (RM20 for adults and free entry for bears), I took a picture of myself sitting in front of the delicious fondue in protest. Our first stop was straight to the lavender farm. 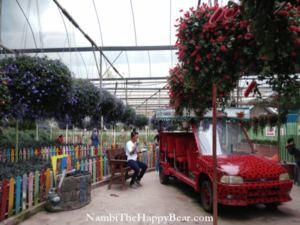 We never expected to find a lavender farm within the Genting Strawberry Farm located in Gohtong Jaya! To reach the farm, go to the first intersection and then turn left, once you reached the end then take another left turn. Keep walking following the signage to the lavender farm. 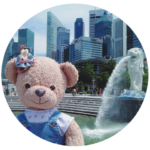 As a highly intelligent bear, I could smell the lavender from miles away. I knew we were at the right place when we were greeted by the sight of millions of purple lavender flowers. The lavender field was vast and I can’t seem to find where it began and where it ended. I dived head first into the lavender field and rolled all over. Got the lavender smell all over my fur, smells soooooo nice. Papa said the lavender belongs to a species called the Mona lavender, a hybrid created in the Kirstenbosch National Botanical Gardens of Cape Town, South Africa. I am proud to say that I have seen, smelled and touched the petals of a real lavender flower with my own paws. Mama was busy taking selfies and checking out the lavender souvenir shop. Inside, there was a great selection of products made from lavender, and they all smelled pretty good to me. I was tempted to get myself a lavender soap but then I remembered that I only shower once a year hehe. Soon, there were tons of other visitors to the lavender farm. Suddenly a guy approached my papa mama and asked them if they wanted some photographs. He said it was a free service, we only have to pay for the photos if we liked it. After much consideration, I granted permission for the photographer. The photographer was charming, experienced and skilful. He guided papa, mama and me to pose for photos at various scenic spots around the lavender farm. While we were taking our photographs, the other visitors stared at us, some human kids were laughing at me. I was very embarrassed. Luckily the photo session was soon over. I personally thanked the photographer and said goodbye to him. He told us we can have a look at our photographs on our way to the exit. Moving on next, we went to the strawberry farm to pick our own strawberries. Mama, papa and I shared a basket to collect our strawberries. I was the first one to spot a big red ripe strawberry. Mama warned me not to eat the strawberry before we pay. Argghh I wanted to take a bite of the juicy red strawberries! 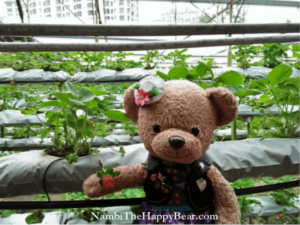 There were so many rows of strawberry plants, I almost lost my way there. I had to get the help of a worker to reach some of the strawberries as I wasn’t tall enough. When we check out at the counter, the self-pick strawberry was charged at RM8 per 100 grams. One funny thing I noticed, the sweetest strawberries were usually those odd-shaped ones. Almost all of the nicely-shaped strawberries were sour hehe. 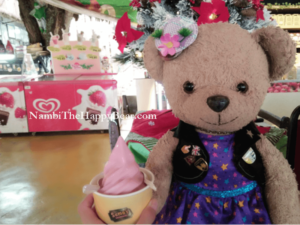 A visit to the Genting strawberry farm would be incomplete without tasting their strawberry ice cream. I have decided that merely eating the strawberries were not enough for my tummy. So, I insisted mama and papa get me the strawberry ice cream. Was it for RM7 or RM8? I can’t remember exactly. More importantly, I don’t like the taste of the ice cream, it tasted exactly like the Neapolitan ice cream that you can get in the supermarket. You know, the Neapolitan ice cream that usually comes in a plastic container, made up of vanilla, chocolate, and strawberry ice cream? Since papa already paid for the ice cream, he had no choice but to finish it, poor papa. As we walked, we noticed this strange flower. Its bright emerald colour seemed out-of-this-world. Papa has never seen this flower before, so papa asked the Malaysian Gardeners to help ID this flower. Turned out this was the turquoise jade vine, a plant considered rare in Malaysia. According to my research, it originated from the native tropical rainforests of the Philippines, where the locals call it the “Tayabak”. It was prized for its highly unusual colour, unlike that of almost any other plants in the world. Here, it was grown over a pergola to show off the beautiful cascading flower trusses. I was excited and wanted to show this to my other bear friends. However, my papa pulled my ear for trying to take the jade vine home. Why papa…………? 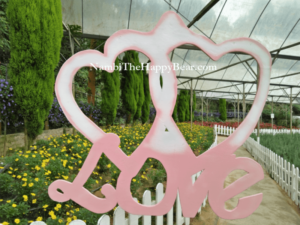 Another type of flower that really impressed me was the Gerbera Daisies over here in Genting strawberry farm. Gerbera is a large genus in the same family as the sunflower. Native to tropical regions of South America, Africa and Asia, the flower was named after a German botanist named Traugott Gerber. The farm managed to grow Gerberas in spectacular colours of red, pink, orange, yellow, white, cream, and some even carried more than one colour! I was dazzled by the variety of colours available that I almost fainted. If you were like me, you would wonder if they were real. Therefore, I have personally tested and verified that the flowers were indeed real by licking them. 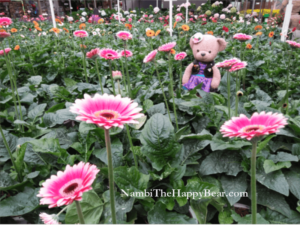 I could even play hide and seek in the sea of Gerbera Daisies. Can you spot me in the photo? I bet you couldn’t. The little Gomphrena globosa, or also known as the globe amaranth is actually an edible plant! The round-shaped flower inflorescences were very pretty. The sun was getting stronger so I had to put on a gardening hat while papa and mama joined my guided tour of the Gomphrena area. The Gomphrena was often overlooked by visitors because it was unfortunately grown along the way to the star attraction which is the lavender farm. Visitors usually have their eyes fixated on the lavender, often not noticing the beauty of these tiny little flowers. While we were there, we managed to spot the red and the pink Gomphrena variety. They were native to Central America including regions of Brazil, Panama, and Guatemala. In case you were wondering, this place has tons of roses too! I was looking for the perfect rose to give to my mama. This was where I learnt that roses have pretty sharp thorns. I got my paws pricked and I have to cry to mama. Luckily I did not bleed. Papa applied a band-aid to my wound to stop the cotton from coming out. He said we were not supposed to pick the roses here, these were the rules in the farm. No…. papa. 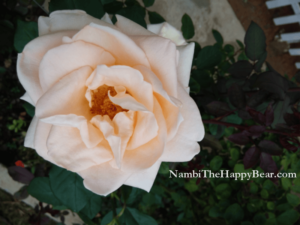 I wanted to give the peach colour rose to mama because a peach rose signifies appreciation and get together. I didn’t know this would happen. Please forgive me, mama, for being such a troublemaker all these years (am I?). Instead of the Great Wall of China, here we had a Great Wall of Petunias stretching about 20 to 30 metres long. 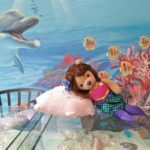 The name Petunia originates from the French word “petun” which means “tobacco”. Did you know that Petunias are closely related to tobacco, tomatoes, potatoes and chilli peppers? 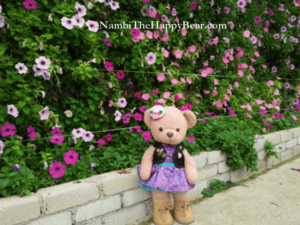 There were some mythical stories related to the Petunia. The Mayan and Incas believed that petunias can drive away underworld monsters and spirits hence they made magical drinks out of petunia flower beds. In the Genting Strawberry Leisure Farms, I count at least 3 different colours of petunia at full blossom sprawling the entire length of the fence. Heheee so tempted to make magical drinks out of these flowers to ward off evil bear spirits. Hanging high up were these gorgeous little red hot cat’s tail. The plant is native to the Malesia and Papuasia botanical region. It has many different names such as the Philippines Medusa, the chenille plant, or the fox tail. In Malaysia, many bear friends call it the pokok ekor kucing. The fuzzy and dangling flowers looked like cattails indeed! However, I do not think I have seen any cats in red fur before. Papa lifted me in the air to get a closer look at this unusual plant. The red fur made my nose itchy. Enough papa, I was happy to just watch from the ground below. The hydrangea was my mama’s favourite flower. She spent a lot of time in the hydrangea garden. There were pink, white, yellow and blue hydrangeas inside this farm. 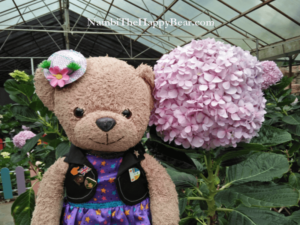 Look at the size of the hydrangea flowers! They were as big as my head omg! How did they manage to grow it to this gigantic size? I think they were probably fed tons of fertilizer every day. The cold weather at Gohtong Jaya was probably another contributor to this feat. Papa said the white hydrangeas were the most common. Mama said you can sometimes find red, light purple, or dark purple hydrangeas. If mama was right, in certain hydrangea species the colour is determined by the relative acidity of the soil: an acidic soil (pH less than 7) usually produce blue and purple flowers. Whereas an alkaline soil (pH more than 7) will produce pink or red flowers. Also mama, may I take this hydrangea home? 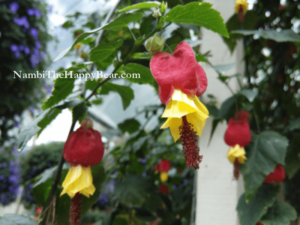 For my bear friend’s wedding, kiki…..
Of all the different plants in this leisure and strawberry farm in Genting, the Abutilon megapotamicum stood out among the rest as the one really odd plant. The colour of this flower was a distinct red and yellow, almost as if someone had painted them that way. 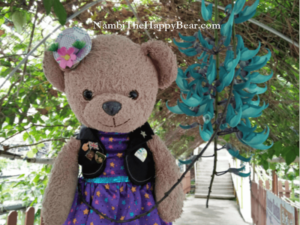 Just like any other curious bears, I licked every single flower to make sure they were real. I could see the resemblance to the Chinese lanterns. Native to Brazil, this plant has dangling yellow flowers suspended from fiery-red calyxes. Although I have verified the authenticity of the flowers, mama and papa were not convinced and they thought the plant was fake. 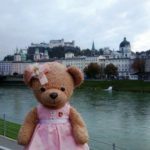 I believe that mama and papa need to have faith and put more trust in me because a bear’s intuition with regards to nature is always better than humans. There was a small section in the Genting Strawberry Leisure Farms where you can buy potted plants. 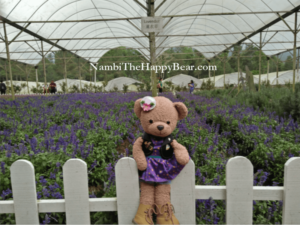 I saw lavenders, roses, gerberas, petunias, hydrangeas, gomphrena, strawberries and more! There was even small potted cactus for sale at RM5 each. The plants were healthy here at Gohtong Jaya, but I wasn’t too sure if they will thrive in the lowlands. Plus, you could easily get the same sizes of cactus at 3 for RM10 in Green Lane Sungai Buloh. Therefore papa and mama did not buy anything from there. I was hoping papa could get me a pot of Mona Lavender as this species could not be easily found elsewhere. Strawberry plant too, so that I can eat fresh strawberry fondue everyday hehee. All good things have to come to an end. It was getting late and we have to head home. 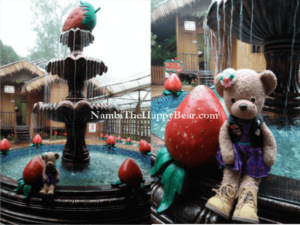 Our trip to the Genting Strawberry Leisure Farms was definitely the highlight of the day! Before we left the place, I took an obligatory photo with the strawberry mascot perched at the entrance. The mascot looks so fat and delicious compared to me kekekeke. 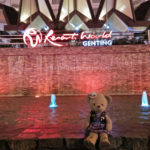 See you next time, Genting Malaysia, we had a fun and enjoyable visit here.